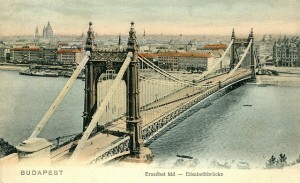 Elizabeth bridge (or Elisabeth Bridge) was originally built in 1897-1903, so after the Chain Bridge, Margaret Bridge and Liberty bridges. The name was in honor of Empress Elizabeth of the Austro-Hungarian Empire, the Hungarians great favorite, who you probably know as Queen Sissi. 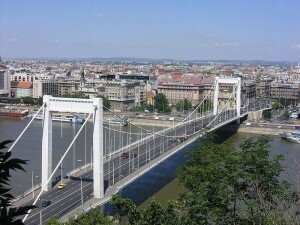 It is one of the main fast traffic bridges of Budapest, and is perhaps not the most attractive, but it too has some stories to tell. Interestingly enough, there was a huge scandal surrounding its precise location, that still rebounds today some 120 years later. A wealthy businessman greased a few palms to ensure that the exact stretch of Buda shore that he happened to own, would be approved for the project. Though nobody was bring any charges, it has had a long term effect. In 1945 the German forces ended up completely destroying the original elegant suspension bridge. 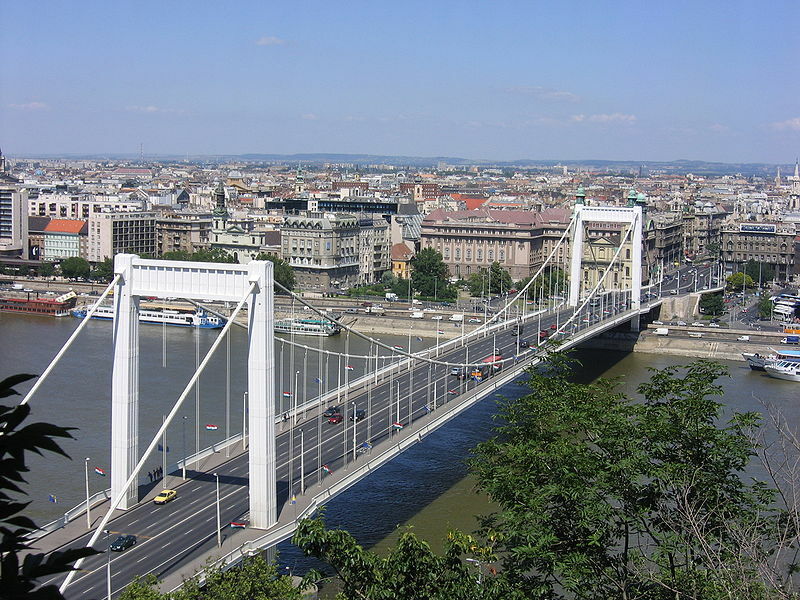 Like all of Budapest’s bridges, it was in such bad condition that there was no point in restoring it. Way later in 1960, there was a complete rebuild in a new modern design. Because it was economical to reuse the existing foundations, so the same piece of land from 1897 was once more put to use. 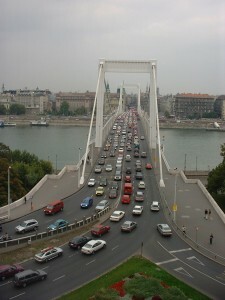 The trouble was, sharp bends were a requirement to avoid running approach roads through the body of Gellért Hill. While this had not been an issue in horse-drawn pre-war times, the advent of fast motor traffic was quite a different story, and the bridge has been the source of many serious westbound accidents. Though the bridge originally had tram tracks, with their removal in 1972, the addition of more car lanes was possible, making this the only 6-lane bridge in the inner-city, and thus one of the fastest. Check out the statue of Empress Elizabeth in the small gardens to the north of the bridge on the Buda side, and the submarine-type doors in the towers that the bridge workers (who are obviously hobbits or Oompa loompas) use to access the upper levels. Previous story Fisherman’s Bastion, Budapest’s Cutest Sight!